Mary Garrett is a certified health education specialist and American Council on Exercise-certified lifestyle/weight management coach. She holds a Bachelor of Science in health promotion from the University of North Carolina at Pembroke and is completing a Master of Arts in counseling at Saint Martin's University. Can Pregnant Women Eat Fat Free Yogurt? Can You Lose Weight Eating Sushi? As one of three energy sources -- the other two being carbohydrates and fat -- proteins are the body’s building blocks. Each cell in the body needs the amino acids that make up proteins. Your body cannot make them all, so they must come from the food you eat. In fast-paced modern lifestyles, however, the best protein sources need to be lean and low in saturated fats. The USDA recommends children age 2 to 8 need between 2 to 4 ounces of protein daily and most people age 9 and up need between 5 and 6 ounces daily. Look for healthy protein sources on your next grocery store outing. Animal proteins include dairy products, red meat, poultry seafood, pork and eggs. These sources are complete proteins, meaning that they contain all of the essential amino acids your body needs. Choose red meats low in fat such as top loin, top sirloin, bottom round, round tip roasts and round steaks. Ground beef that is at least 90 percent lean is the healthiest -- the leaner the better. When purchasing pork products, choose tenderloin, loins and ham. Skinless chicken and turkey breasts are healthy poultry choices. Avoid excess sodium; check nutrition labels for sodium content to make the healthiest choice. Low-fat processed meats containing few additives and low sodium content are best. Remove all fat and skin prior to cooking your animal products. A variety of wild, fresh seafood, is a healthy source of protein, especially from waters monitored for pollution and regulated for over-fishing. Use healthy cooking methods such as grilling, roasting, broiling, poaching or baking. Drain all visible fats. Canned fish and chicken packed in water and low in fat are healthy protein sources that store and travel well. Choose cheese low in fat and use it sparingly. Plant sources contain incomplete proteins, meaning they lack some of the essential amino acids. These include chick peas, black beans, split peas and tofu for example. Soy and quinoa, a grain, are the exceptions as they are the only plant sources considered complete proteins. Combining incomplete proteins at one meal, such as beans and rice, was at one time considered necessary for obtaining all the essential amino acids, but a 2009 statement from the American Dietetic Association notes that a variety of plant proteins eaten throughout the day will provide all the necessary amino acids. Plant sources of proteins provide other nutrients, such as vitamins, minerals and fiber, making them excellent protein sources. They are also low in fat. Nuts and seeds are excellent sources of protein containing the healthy unsaturated fats, such as monounsaturated fats and omega 3 fatty acids, protein, fiber, vitamins and minerals. They are typically high in calories, so limiting the portion size is necessary for maintaining weight. Try pumpkin seeds, sesame seeds, walnuts, almonds, hazelnuts, Brazil nuts and butters, such as peanut and almond, for a variety of nutrients. Some grains are high in amino acids such as quinoa, buckwheat, amaranth, bulgur, millet and teff - a product from Ethiopia. Quinoa, originally from South America, is nutty in flavor and cooks fast. Buckwheat is often found in pancakes and soba noodles and has a rich flavor. Amaranth, another South American grain, is earthy and nutty in flavor, gluten-free and high in fiber. The American Diabetes Association states that this grain is good for use as a thickener for soups and stews. The Middle-Eastern-derived grain, bulgur, is a relative of wheat with a chewy but mild flavor. 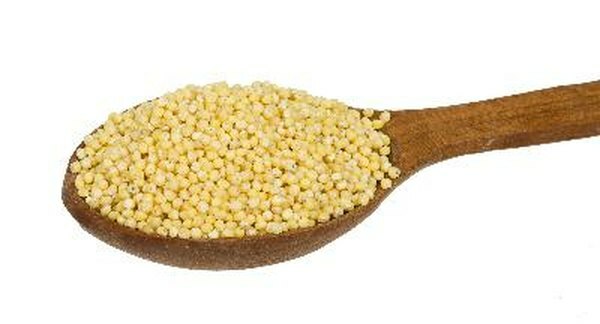 The ADA notes millet has a mild flavor and a soft texture. Teff is gaining popularity in the United States, arriving from Ethiopia and gracing tables with a sweet, chocolaty flavor. Try this one is your next bread recipe. Teff is high in iron, calcium and gluten-free. Protein-rich grains are also high in fiber, vitamins and minerals. Use these products in place of white rice or pasta to increase your fiber and protein consumption. Is Steak Healthy to Eat?